"Gene "Shorty" Joseph Peterson circles the track during the national anthem before competitors race lawnmowers at Salem Arena, Saturday, June 19, 2010. Those riding mowers, which were of all shapes and sizes, competed in four classes, with top speeds reaching 30 mph. 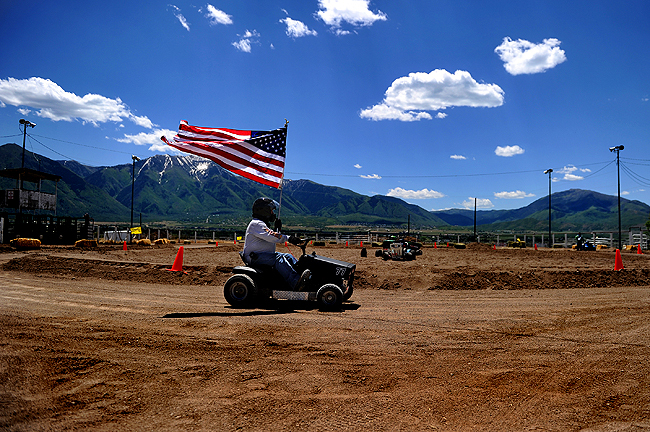 Gene "Shorty" Joseph Peterson of Springville was racing for the first time this year. "I just retired and have been wanting to do it for years, " Peterson said. "It's the most fun I've had without drugs or alcohol."" I'm out of pocket and probably off the grid for the next two weeks. No, I won't be on a national lawnmower racing tour. I'll be traveling out of the country and I am not sure how efficient Internet will be. I know it will be available, but probably slow for uploads. I'll probably be on an e-mail only contact. So obviously I'll either be posting very little or not at all. Feel free to search the archives or head over to my website in the meantime. Enjoy the United States while I am gone.